Last weekend, we were in Kolkata, pigging out after the IIM C recruitment trip. 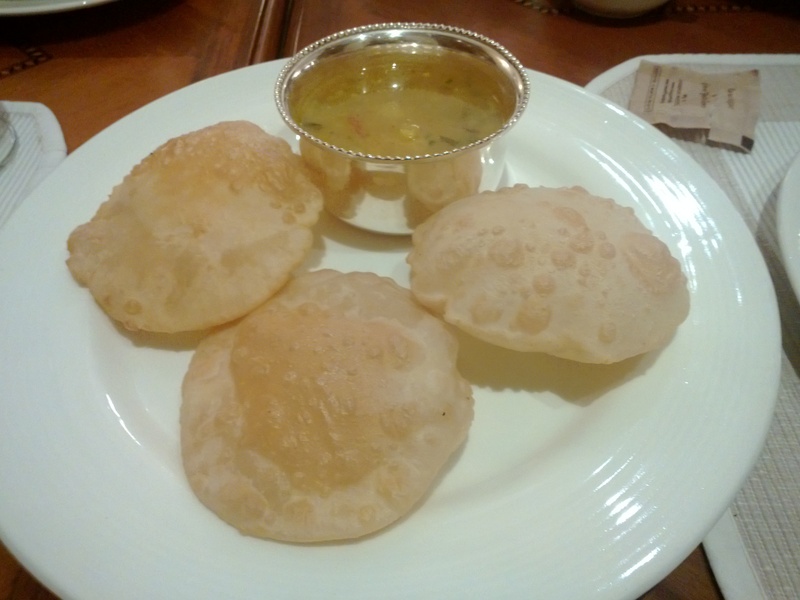 Bengali food was on the menu and so was visiting a couple of key attractions in Kolkata. With Varun in tow we didn’t want to do too much and generally take it easy. 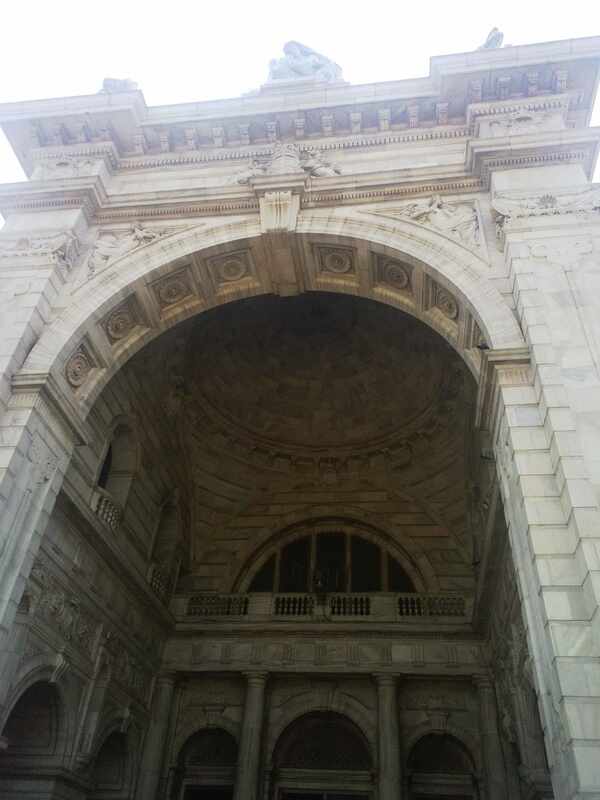 First up was Victoria Memorial. 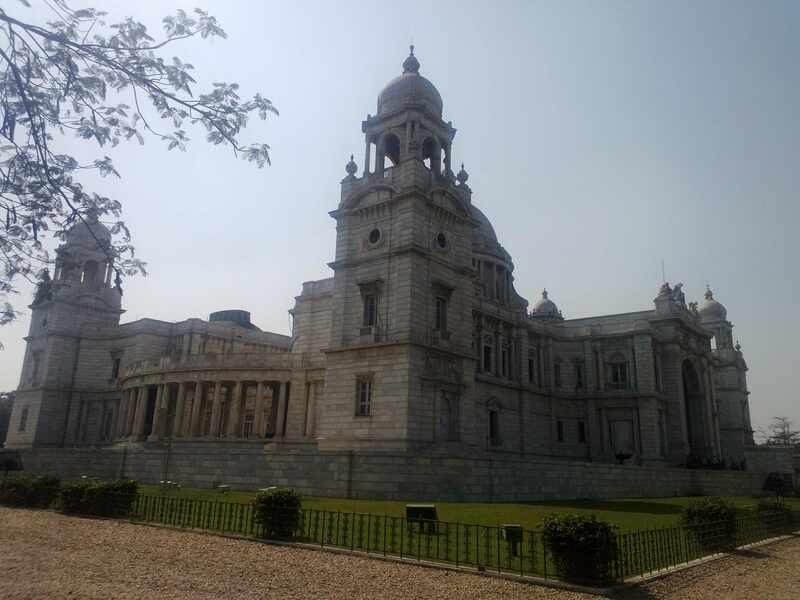 An elegant white marble structure which was created as a tribute to Queen Victoria houses artifacts from British rule era. Paintings, rare books, arms and ammunitions, sculptures, letters etc. I loved that the monument is not too big that it takes hours to browse through it all. It is surrounded by acres and acres of lawns, blooming gardens and ponds. 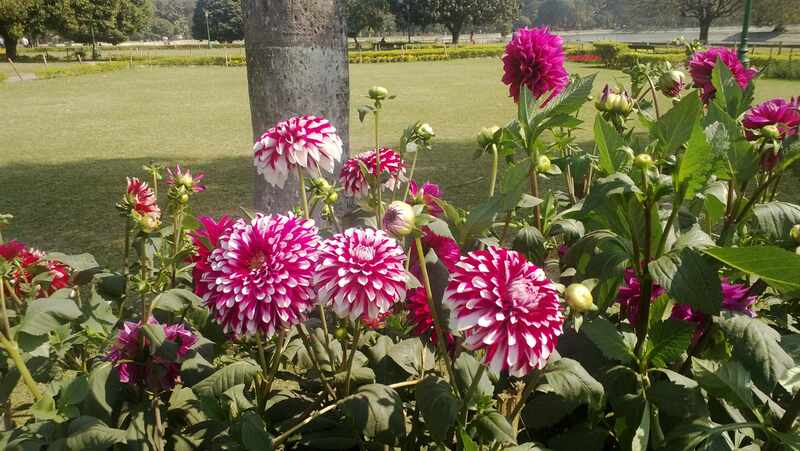 Its adds to the tranquility of the place. The school kids and blooming flowers added life to this still monument. But this is not what I had imagined Kolkata to be. Everyone had warned me that Kolkata is dirty, polluted. Howrah station and its narrow by lanes, cows on street and lyrical Bengali on the streets. I didn’t experience any of that. 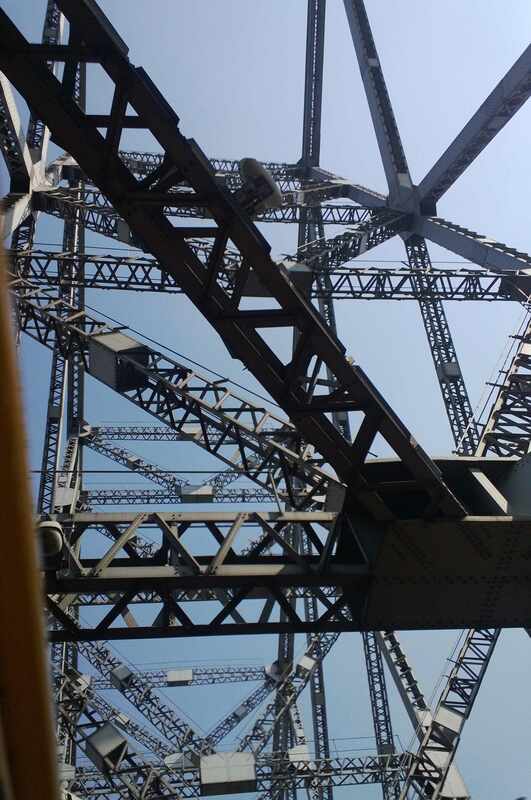 So, we decided to brave a taxi ride across the Hoogly river to Howrah. 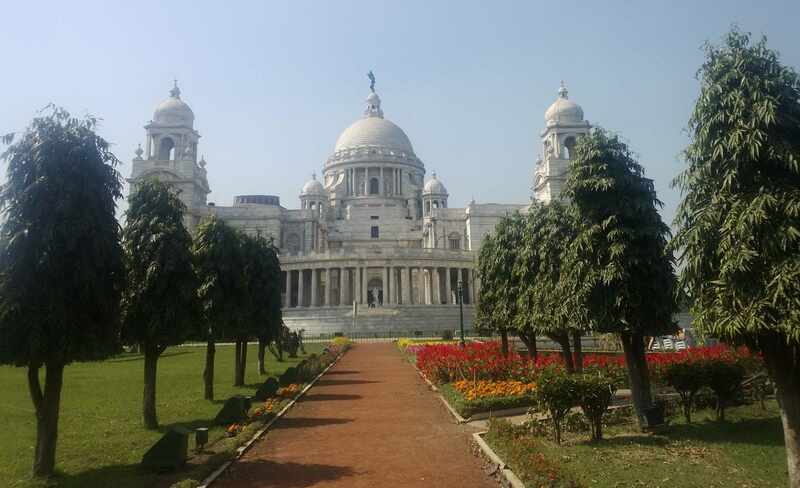 Outside the Victoria memorial we hailed a cab and the driver sped across open green maidans over to the new bridge or the Vidyasagar setu. Once across in Howrah we had a shock. The lanes along the river bank are narrow and crowded with people, animals , automobiles and hand pulled rickshaws jostling for space. At one point, the taxi driver drove over an open stretch of garbage overflowing on to the streets. It seemed we were driving though a block of garbage! The stench of garbage, sweat, trains and vegetables intermingled in the early afternoon heat. A few stray cows grazing on that garbage and left over vegetable remains added to the chaos on the bridge. This is the first experience for folks who take the train in to Kolkata. Sad. I know. It took us forever to get to the other side. 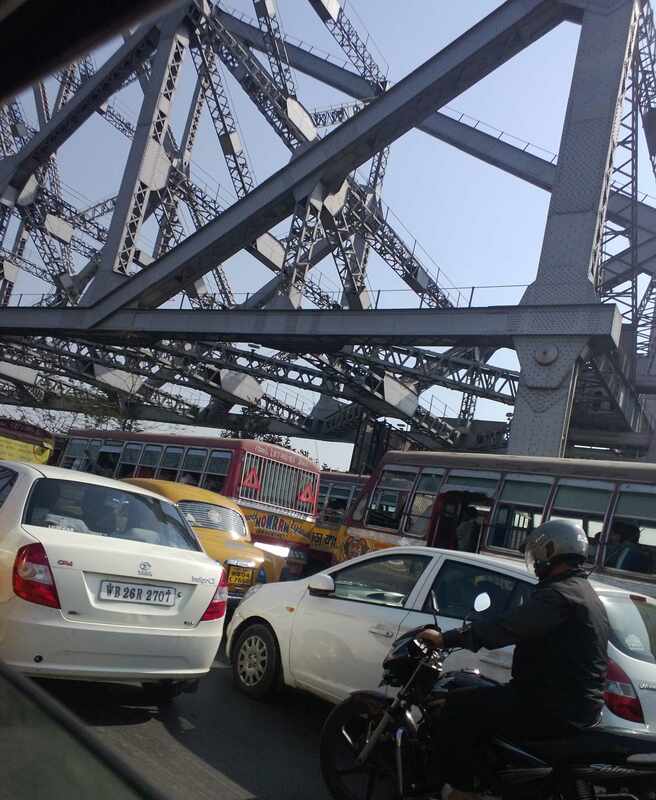 Once on the other side of the bridge, we were greeted with yet another quintessential Kolkata sights – a rally. A political rally to oust the current government or some such thing. Having just visited the Victoria Memorial’s collection of oil paintings of freedom fighters and their letters, I pondered if the rallies in early half of the last century were just like the one we saw. 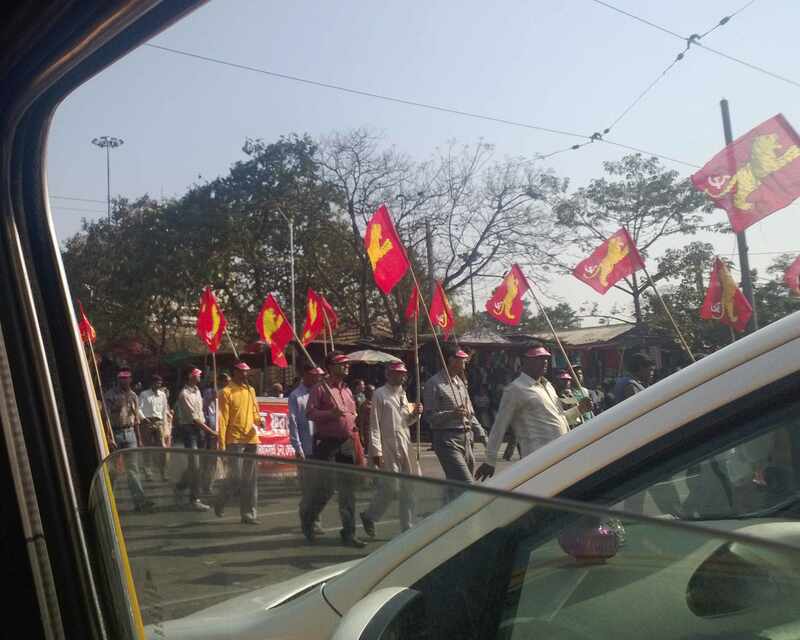 Colorful flags, sonorous chants, pedestrian demands of freedom and independence from the British rule. These were the very streets that witnessed the movement then and is seeing it once again. Once back on the saner, cleaner side of Hoogly river, we headed back up to the hotel for a nap. Varun was drowsy and we didn’t want to keep him up unnecessarily. After a long nap, we mainly went to New market famous for leather bags and clothes though we focused on street food. And later to Park street for some more good eats. 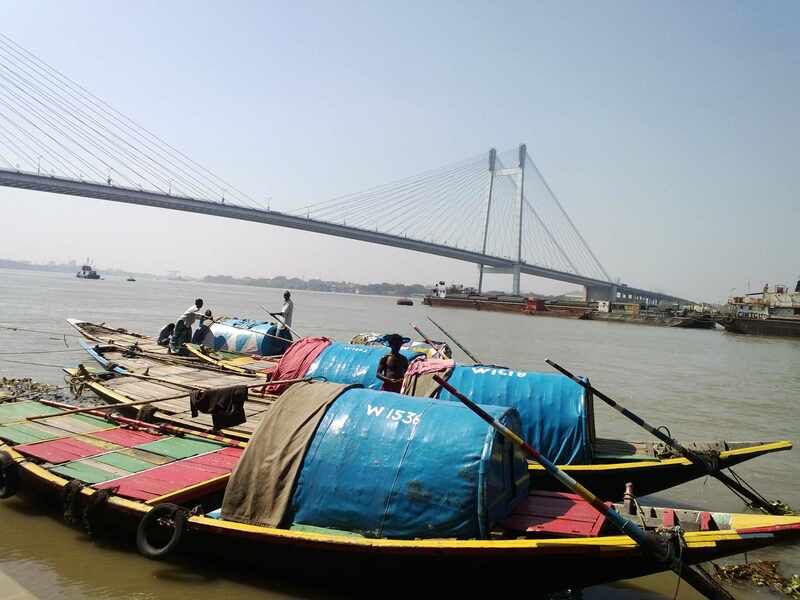 The following morning, we went to see the Princep Ghat which offers views of both the bridges over the Hoogly river. The taxi drivers in Kolkata, unlike their Mumbai brethren, don’t know the directions to local tourists destinations. Some say no and don’t take your fare, others nod and drop you to a different place,. It happened to us a couple of times. We were dropped 3- 4 blocks away from where we wanted to go and then had to walk down to our destination. with Varun and his diaper bag in tow. The cab driver dropped us at Babu ghat where families were bathing in the river, priests were offering prayers and generally had a religious air around it. I couldn’t imagine dipping my toes in the brown muddy waters of Hoogly but life continued as normal on its bank. A barber shaving, kids jumping with glee, women folk changing out of wet sari’s while covering their modesty, men lathering the soap rather vigorously. Varun was thrilled to climb down the stairs and wanted to get in the water. We somehow managed to hold him. 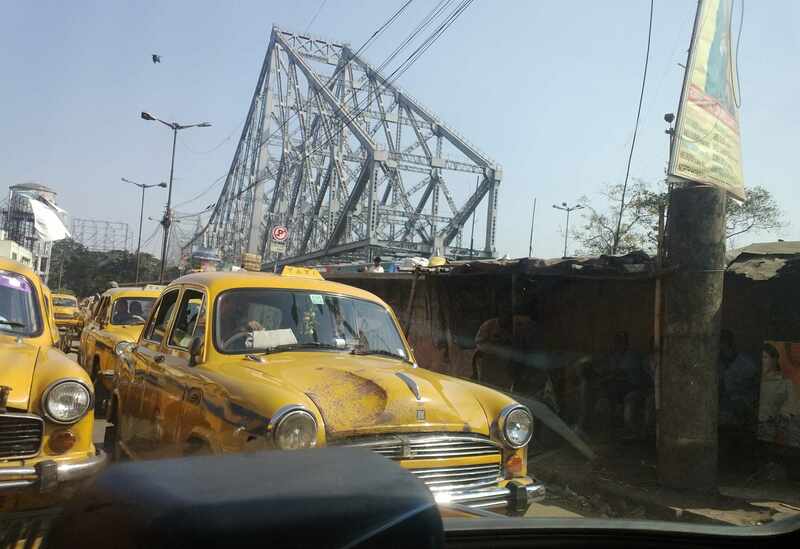 We took another cab to Princep ghat – which is next to Princep station. 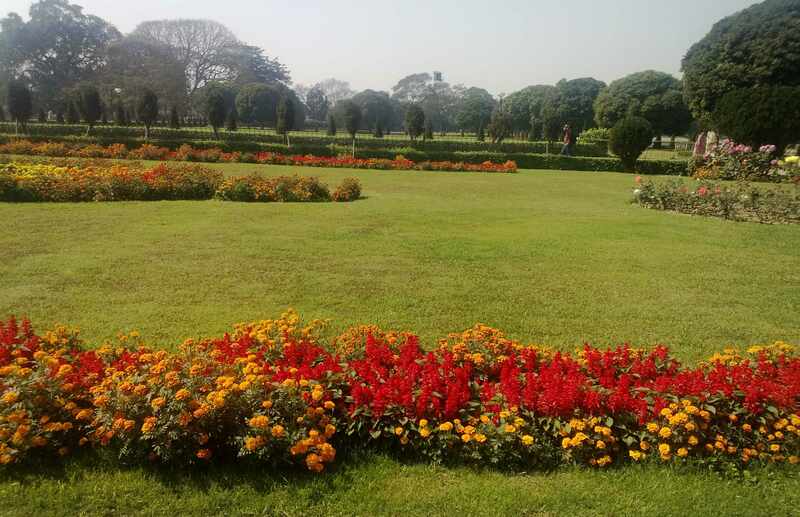 Clean and maintained, it offers a calm and quiet place to stroll along the banks of Hoogly river. 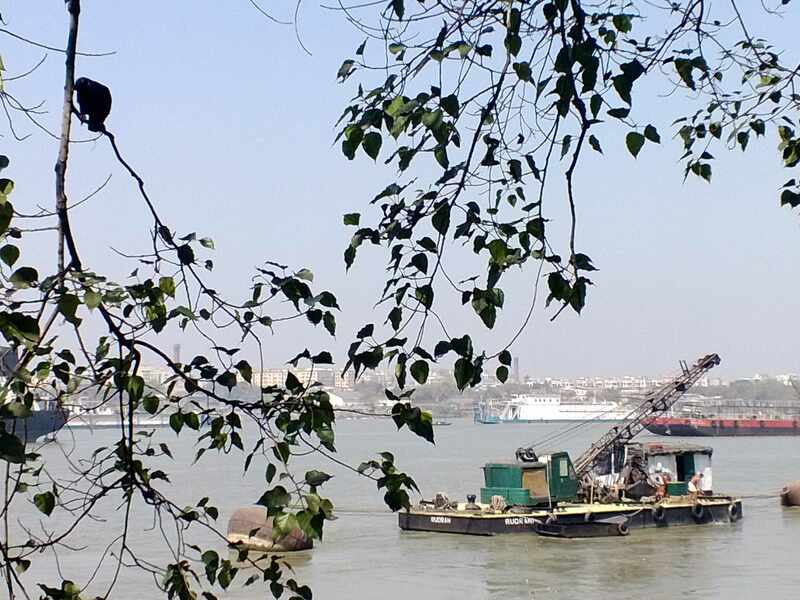 Overlooking the Vidysagar bridge ( new bridge), it offers chat vendors, benches, restrooms and even boat rides on the river. We didn’t see folks praying and priests preying on them here. 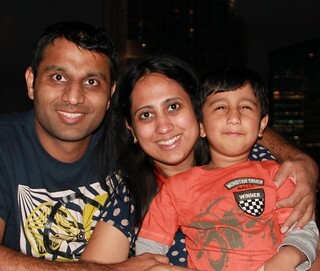 We hung out, had some jhaal muri and let Varun run around. Soon, it was time for us to head back. 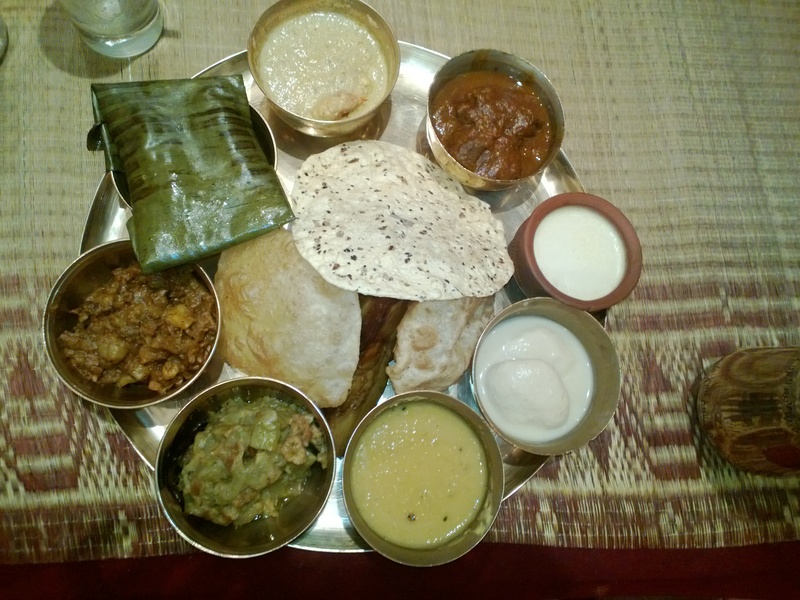 Pickup sweets at KC Das and then feats on the scrumptious Bengali thali at Aheli. 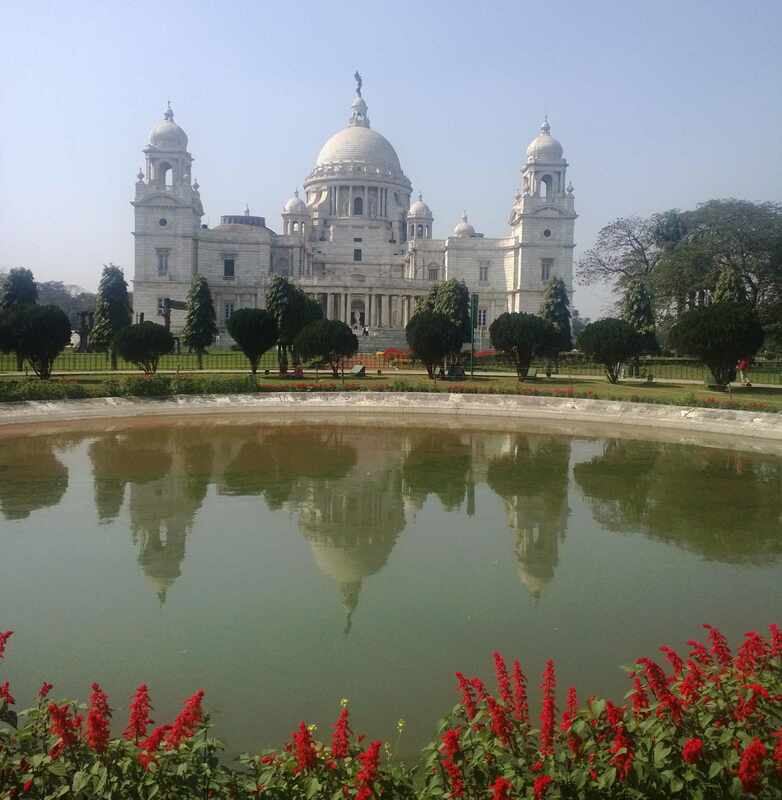 We didn’t get to visit some of the temples Kolkata is famous for – Kali temple and Dakshineshwar temple. Hopefully next time, we can stay longer in this laid back city. Till then we need to find someone to bring us some Sondesh! We were in Kolkata this past weekend. I had to go on a recruitment trip to IIM – Calcutta on Friday so Vipul and Varun joined me on Friday evening and we spent the weekend feasting on Bengali delicacies. 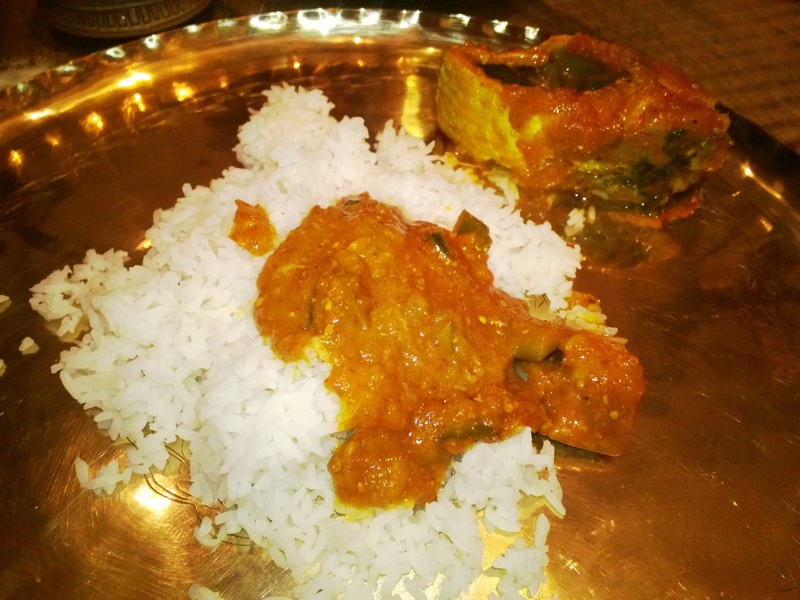 I was introduced to Bengali cuisine at my best friend’s house – simple joy of fish curry and rice, dal and potatoes. Over years, her family moved to a different city. We kept in touch but I never got to relish authentic Bangla food. Till a fellow foodie, Sandeep, introduced us to Oh! Calcutta. We loved it in Mumbai, Pune and even in Hyderabad. 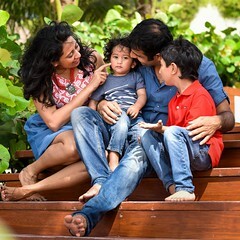 When I had an opportunity to spend an entire weekend relishing the Ilish in mustard gravy, steamed Betki in banana leaf, Chello Kebab and more in authentic settings, we couldn’t resist. Our day started with, Bangla style potato curry and lucchi (pooris) and a pot of Darjeeling top leaf tea! Perfect for a cold February day in Kolkata! After the breakfast we went out site-seeing and then decided to snack on a street side Roll – at Hot Roll , Park Street. Unfortunately, I don’t have pictures of the same but the roll was filling. Reminded me of Kapila’s Kathi Roll from Pune minus the green pudina chutney. Then we had some sweets at Mullick Ballaram, a tiny sweets shop on Park Street, across from the Park Street Post Office. 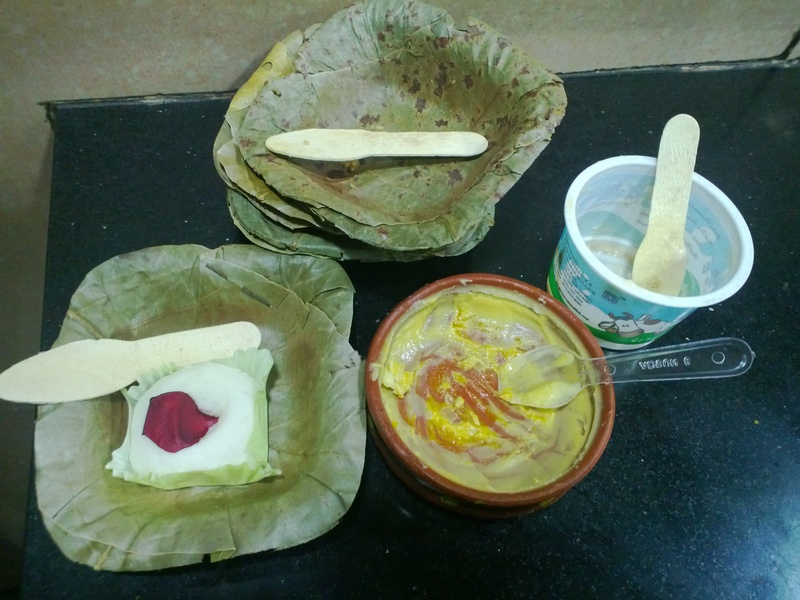 We had regular rossogulla and gurer rossogulla (made with jaggery and brown in colour), misti dahi, aam dahi, rose sandesh, aam sandesh etc. Fresh, soft and melt in the mouth. Antara– Thanks for the reco. We would have never visited this place without your recommendation! Needless to add, we skipped lunch and then set out again in the evening to continue our food crawl around New Market. The evening started with puchkas (or pani-puri’s ) for Vipul and a garam cuppa tea for me. Vipul though the puchka was similar to Mumbai’s pani-puri but the tea was fragrant. 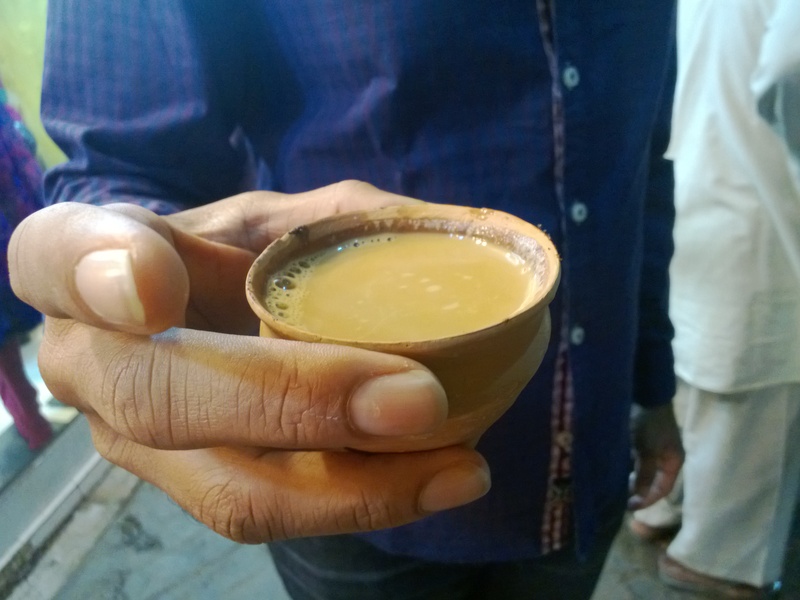 I savored the aroma of ginger and cardamom and tea before sipping it from a clay pot. 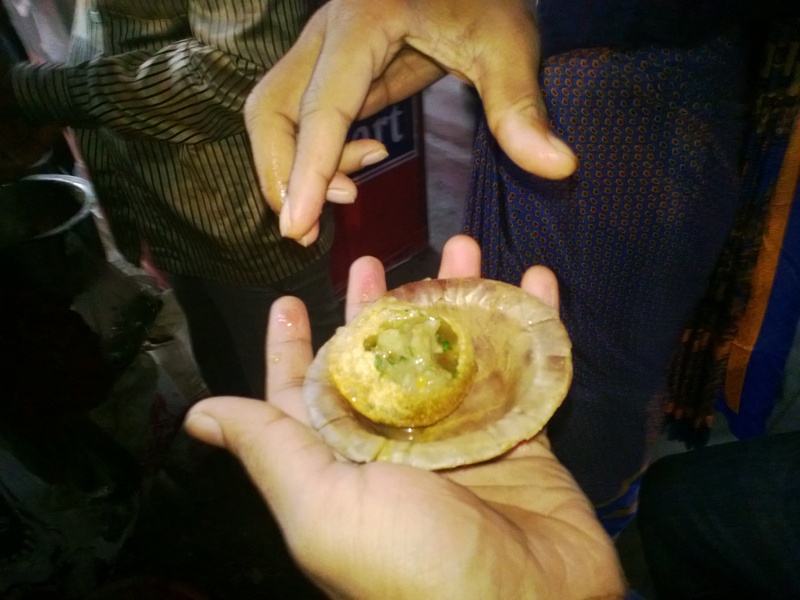 We wandered around looking for Jhaal Muri – another street side snack. 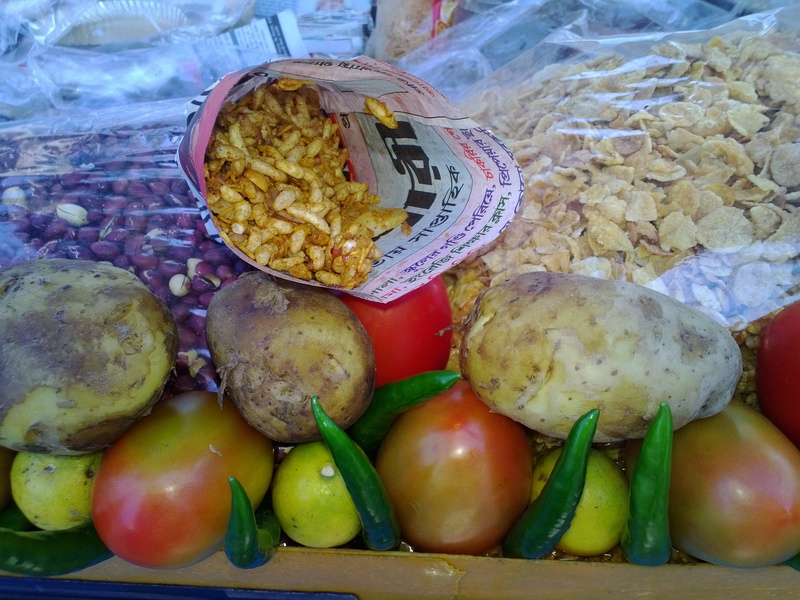 We found many roll’s , chow mein and soup vendors, pav bhaji and moong dal vadas vendors but none that sold jhaal muri. 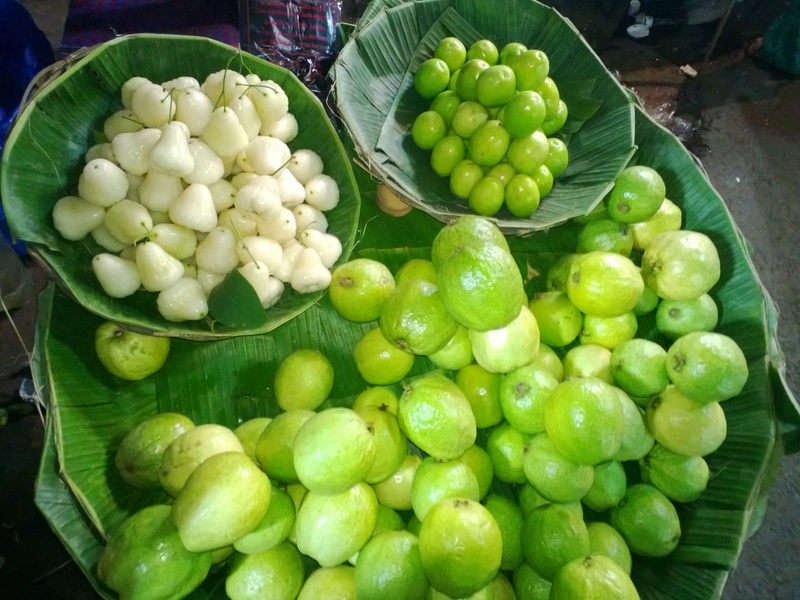 Then we spotted a vendor selling jaam, ber and guavas. Jaam are a favourite of mine with their light crunchy watery taste. We haven’t had them since we returned to India so we bought a few and snacked on them. Then we took a cab to Park street. First stop was Chello Kebab at Peter Cat. 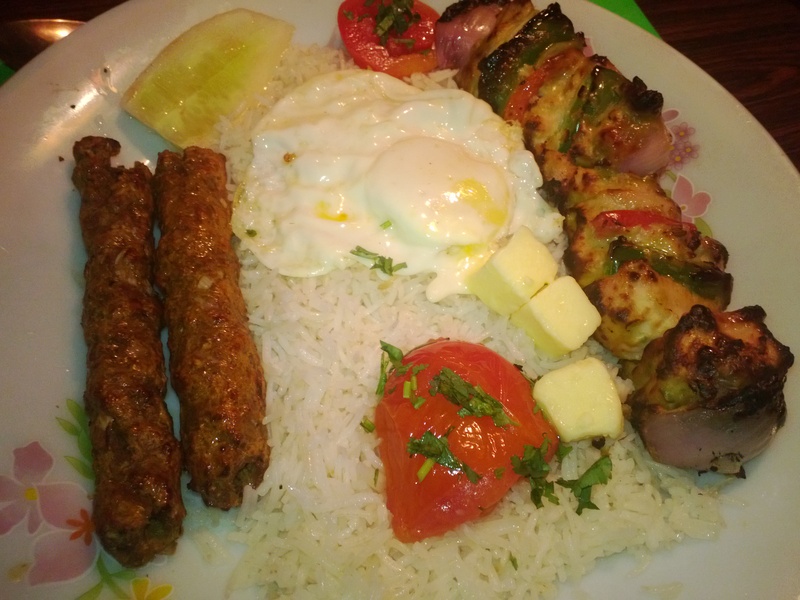 Creamy marinated kebab grilled to perfection served with flavored rice. Butter added to the flavor of rice and Varun had some as well. We continued our evening feasting to Arsalan ( a 5 – min walk from Peter Cat) for our Bengali style Biryani. 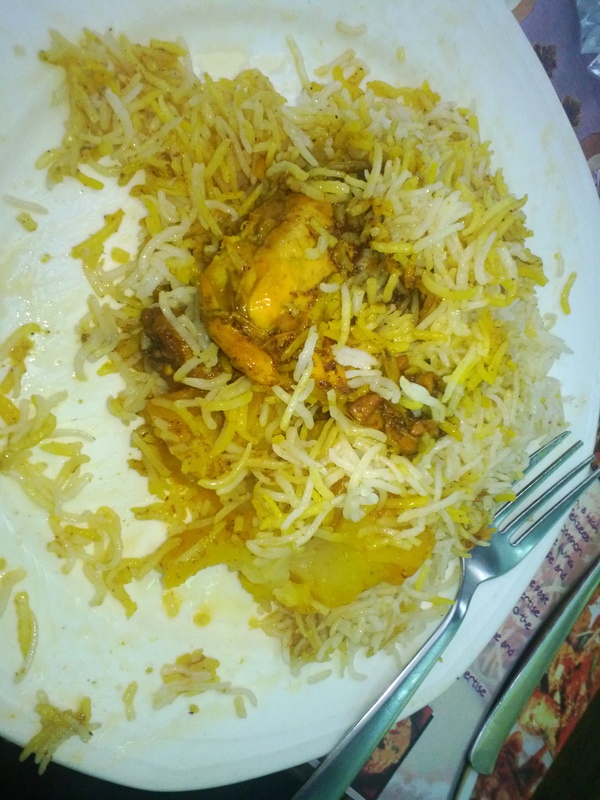 Tender moist chicken, fluffy rice- very different from Andhra style or Hyderabadi Biryani. A must in Calcutta! Thanks Sanjib and Rohit for the recommendations! By now, we were a bit stuffed but we had to visit the legendary Flury’s. 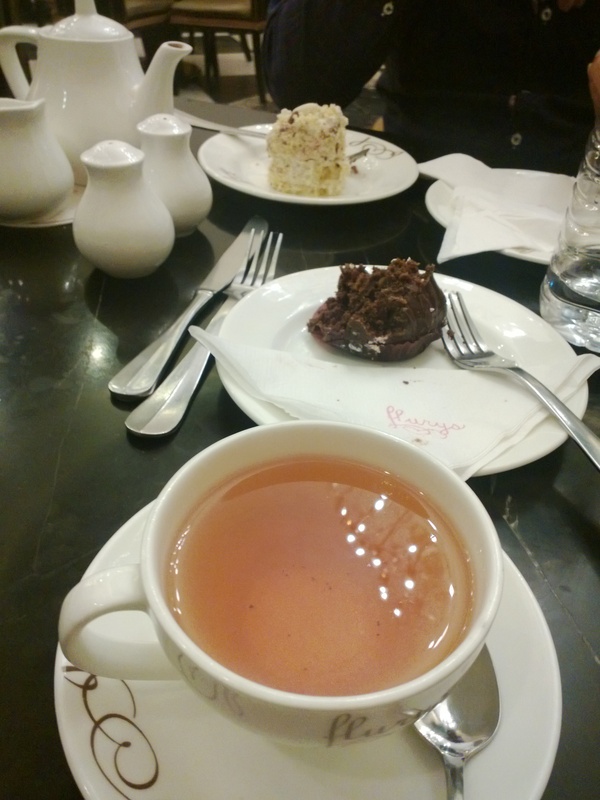 A couple of pastries and another pot of Darjeeling tea and we were done. The following morning, we had a light breakfast of pancakes and French toasts and then went out to visit the ghats. I loved the breakfast spread at Oberoi. They even made a roasted almond and saffron milkshake for Varun and some boiled eggs so he could dig in as well. 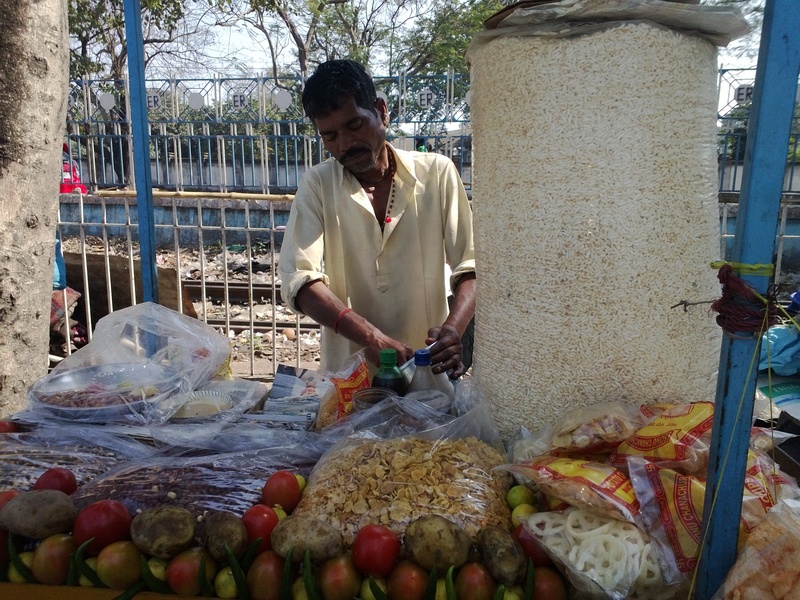 At Princep ghat, we found a jhaal muri vendor. He quickly prepped us a plate and we enjoyed a distinctly mustard oil flavored snack. 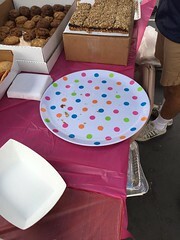 Then we had a quick pit stop at KC Das, another institution for their sweets. 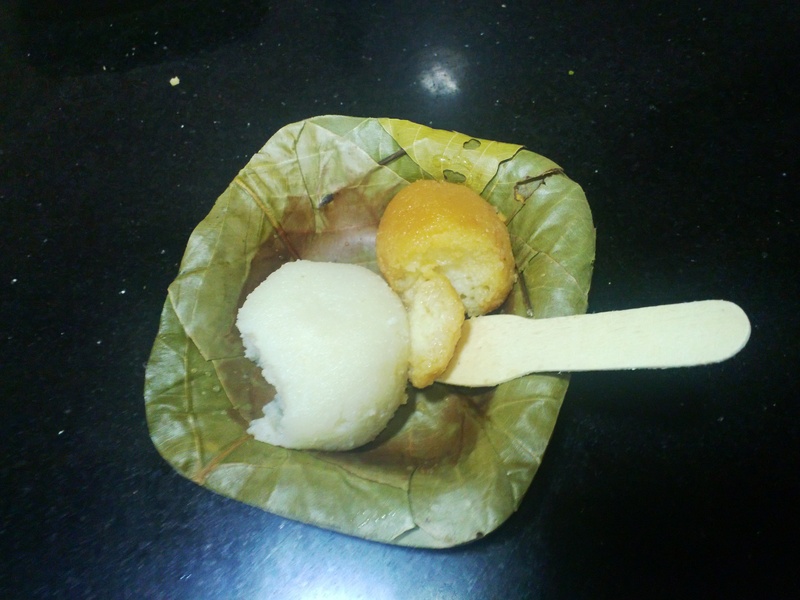 We had some misti doi, sandesh and raas malai while we packed kheer kadam, assorted sandesh and rossogullas to take back home. Lunch at Aheli, Peerless Inn was the highlight and the perfect ending to our trip. 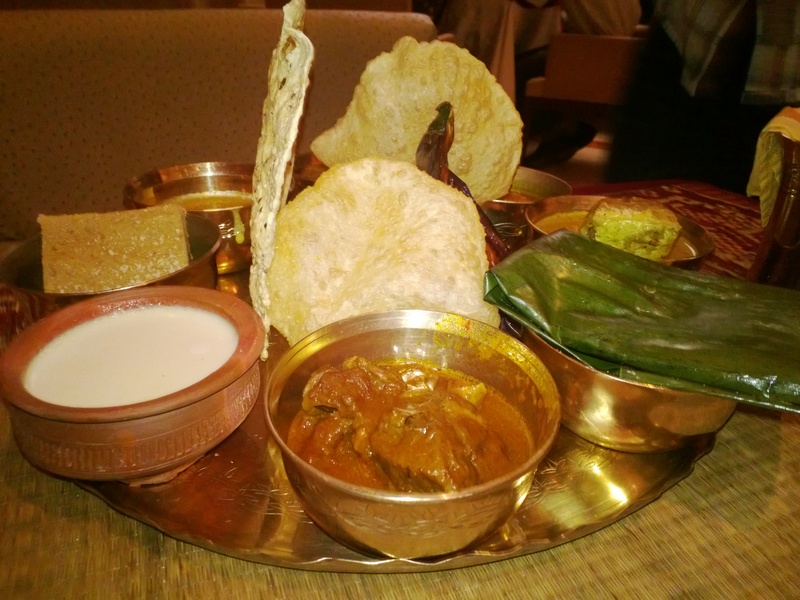 Vipul opted for a veg and non veg thaali complete with prawns in a malai curry, steamed Betki in mustard sauce, Ilish in mustard gravy, mutton gravy while I had a spicier Aam achar Iilish with rice. 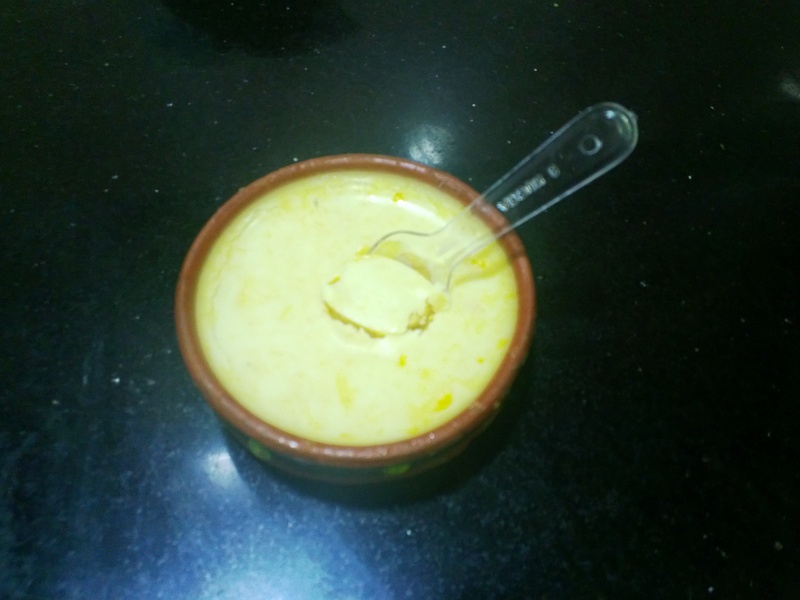 We ended the meal with even more misti doi and sandesh. Varun enjoyed some jhoori moori allo and rice as well as misti doi which he enjoyed as ice-cream! By now, it was time for our flight. We made our way back to our hotel, collected our luggage and dozed off in food stupor in the cab. We dreaded stepping on the weighing scale today.